Manningham congratulates Alan Henderson from Doncaster East, a recipient of this year’s Council of the Ageing (COTA) Achievers Award. 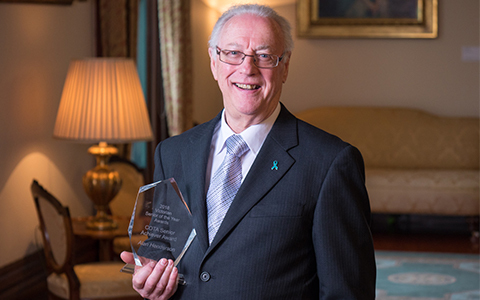 Community-minded and an advocate for an active, safe and inclusive community, Alan was presented the award at the 2018 Victorian Senior of the Year Awards at Government House by The Honourable Linda Dessau AC. For more than 20 years, Alan has been committed and heavily involved in his local Neighbourhood Watch Program. Alan is a founding member of the Manningham Seniors Carers Group and is a tireless advocate for older male carers who struggle with their new role as carer. He is also a founding member of the Manningham Local Dementia Alliance Group and a community representative on the committee, giving insights on how to improve access in the community for people living with dementia. One of his key focuses is the effort in preventing dementia. Alan was involved in a 10 year twin study with his sister in the Older Australian Twin Study Research with the National Ageing Research Institute. With all his commitments, Alan priorities his family. He is a dedicated husband, father and grandfather. Congratulations to Alan Henderson.